Are you signed up to be an organ and tissue donor? I am. You should consider doing so, as you could save lives for others. Here are five facts you may not know about the Gift of Life Michigan. You can sign up to be a donor online. http://giftoflifemichigan.org/become-donor/?_ga=1.250582982.111630397.1433378990 Plus, you can view the campus challenge rankings on this page, which shows 1,556 rankings as of today (June 3, 2015). Family members can create a quilt square for the Donor Memorial Quilts. The quilts are displayed at events and memorials. Plus you can view the square online, like this one: http://giftoflifemichigan.org/donor-families/quilts/lucas-michael-schmidt. 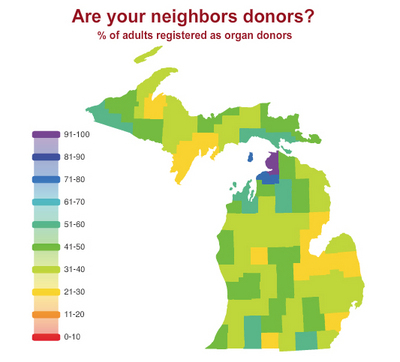 View the map of the state of Michigan showing other donors in your area. My friend Christy is a part of the leadership team as shown on http://giftoflifemichigan.org/about-us/our-leadership-team. Please consider signing up to be a donor. You can't take it with you, and you might save one or more lives in the process. Please click to share and spread the word.